Trick or treat? Cover off on both with these gingerbread cookies! Transform gingerbread men into Gingerbread Skeletons using decorating icing and you'll end up with the perfect Halloween treat! Beat butter, sugar and dry pudding mix in large bowl with mixer until light and fluffy. Blend in eggs. Mix all remaining ingredients except icing. Gradually add to pudding mixture, beating well after each addition. Refrigerate 15 min. Heat oven to 350°F. Place dough between 2 sheets of parchment or waxed paper; roll to 1/4-inch thickness. 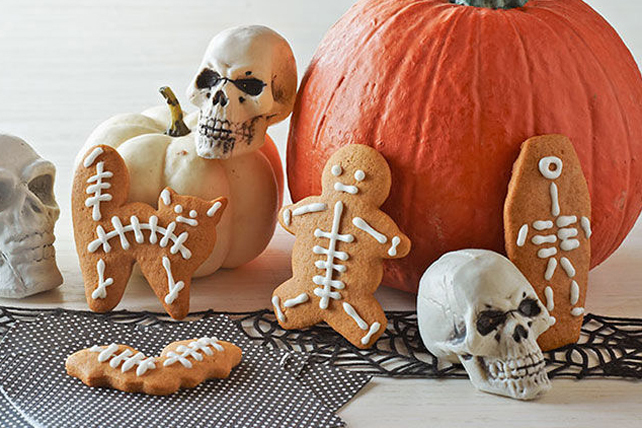 Cut into halloween shapes with 3- to 4-inch cookie cutters, rolling dough scraps as necessary. Place, 2 inches apart, on baking sheets sprayed with cooking spray. Bake 10 to 12 min. or until edges are lightly browned. Let stand on baking sheets 3 min. ; remove to wire racks. Cool completely. Decorate with icing to resemble skeletons as shown in photo. Cookies can be baked ahead of time. Cool, then store in airtight container at room temperature up to 2 days. Decorate before serving.